Kiss It Better | Everything is art/work. It’s for the lovely fishermen and people we talk to and see down at Laughing Waters daily. Lovely because of the conversations we have. Also. 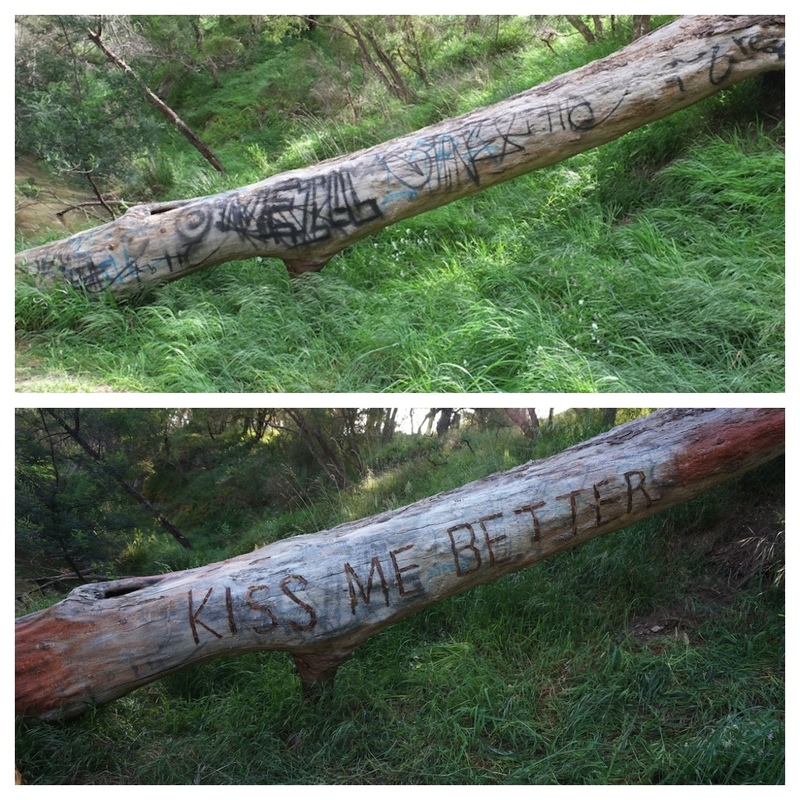 Because some people GRAFFED A TREE. A TREE. WHY WOULD YOU GRAFF A TREE? So. We wanted to cover the graff, and make a statement that provoked people (gently) into being better. We fortunately(unfortunately) found a band-aid down there that said “Kiss it Better”. So became a process of finding eco-ways to paint the log. Trialling of natural glues, colours, natural pigments. In the end we made paint out of a natural water-proof glue made of glycerine, vinegar & gelatine. And mixed in chalk (gypsom) & ground ochre stone. The glue is the same. You can find the recipe here. *Kathy noted: Is it a co-incidence those that eat rubbish (aka maccas & coke) are always the ones leaving the rubbish?